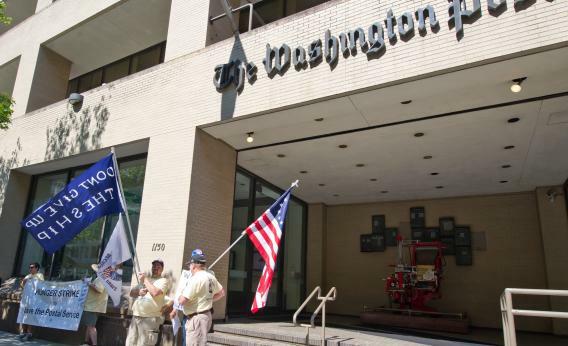 These white guys aren’t op-ed writers even though they’re directly in front of a newspaper building. Just some angry postal workers. Trolling the universe this morning, Richard Cohen wrote a column arguing that it wasn’t racist of George Zimmerman to suspect Trayvon Martin of being a criminal because everyone knows that a disproportionate share of violent crimes are in fact committed by young black men. I think what Cohen really means to be arguing isn’t so much that neither he nor Zimmerman are racists, but that racism is the correct social and political posture. That white people have good reason to fear black men, and that therefore all black men should be put in a subordinate position. But as a logical argument, Cohen here is falling afoul of very poor statistical inference. For example, the vast majority of newspaper op-ed columnists in America are white men just like Richard Cohen. But that doesn’t mean it’s reasonable to see a white man walking down the street and assume he’s a newspaper columnist. If you look specifically at Jewish men, you’ll see the stereotype that we are disproportionately represented in the field of political commentary is absolutely accurate. And yet it is still not reasonable to assume that some randomly selected Jewish man is a professional political writer. Even right here on the mean streets of Washington, D.C.—a city that’s legendary for its high rate of punditry—a clear majority of Jewish men are not pundits. It’s just a very rare occupation. By the same token, the fact that young black men are disproportionately likely to be involved in violent crime in no way licenses the inference that you should stop random black men on the street and begin treating them like criminals. For example, since moving to a majority black city 10 years ago, it is the case that 100 percent of the people who randomly assaulted me on the street were African-American. And yet that was a single incident on one day out of thousands. The overwhelming preponderance of black men I walk past on the street on a day-to-day basis—even the young ones, even the ones wearing hoodies—aren’t committing any violent crimes. If I were to start questioning every single black male teenager I come across as a criminal suspect, I would very much be engaged in unreasonable behavior. Now everyone makes mistakes, but the fact that Richard Cohen has been making this mistake in print for over 25 years leads me to think he just doesn’t care. He knows most young black men aren’t dangerous criminals, but he nonetheless thinks they should all be held under a cloud of preemptive suspicion anyway.